1. Place the bacon, mushrooms and tomato on a grill rack over a lined baking tray and place under a preheated grill for 5 minutes until bacon is cooked and mushrooms are softened. 2. Poach the egg in boiling water for 2-3 minutes. 3. Toast the roll according to pack instructions. 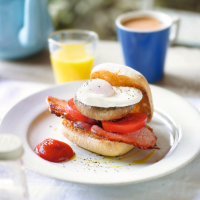 Top the roll with the bacon, tomatoes, mushroom and then the egg. 4. Serve with essential Waitrose Tomato Ketchup and a drizzle of olive oil.